We are happy to inform that a training program was arranged by M/s. Deloitte on 28th March 11 at their office in Hi-tech city, exclusively for our scholars. 192 of our scholars including 35 girls who completed their Graduation / Engineering / MBA / MCA have attended the one day training and learned the soft skills and also the culture of corporate offices. Many of the participants after completion of the training expressed their happiness for selecting them for training in Deloitte, a Multi-National Company. They also informed that the training will be very much useful to them in their career path and conveyed their sincere thanks for the opportunity provided to them. A personality development cell was formed in November 2007 to help final year students develop their personalities so as to imbibe skills in them which will enable them to face the challenges of the competitive world. The first such programme focused on spoken English, body language, presentation skills and instilled a better understanding amongst participants for facing the highly competitive world in an effective manner. 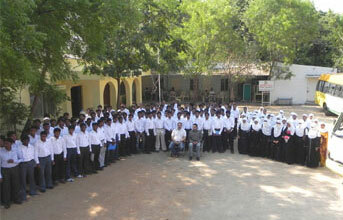 Mr. A. W. Sadatullah of Bangalore grilled 200 students for 3 days during his " Discover Yourself " programme. 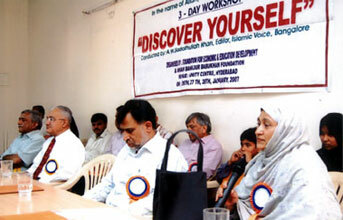 Mr. Jamal Khan of Canada and Ms. Shaheen Subhan coached the students on other aspects of personality development. Due to encouraging response from the participating students, a detailed personality development programme is in preparatory stage. This programme aims at training over 1500 students every year.